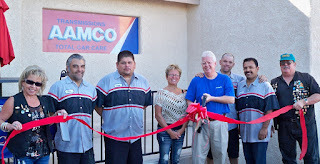 The Lake Havasu Area Chamber Ambassadors held a ribbon cutting ceremony for AAMCO, celebrating its one year anniversary with the Chamber. Attending the ribbon cutting from left to right were Kathy Baumer, Anthony Rios, Jesus Alba, Marty Bledsoe, Charles Bledsoe, Will Graff, Javier Martinez, and Mike Schuler. AAMCO has been in Lake Havasu for 3 years and provides transmission and total car care services. For more information or to see their reviews visit them at www.aamcolakehavasucity.com.